The JT20XP horizontal directional drill (HDD) package features a JT20XP drill and XP44 mixing system and was designed to complement the unique needs of HDD contractors in the mid-sized utility-installation space. 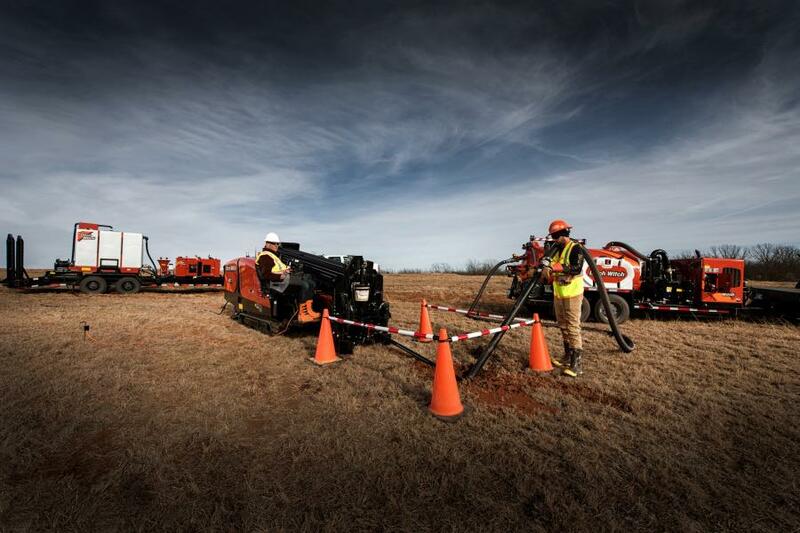 Ditch Witch, a Charles Machine Works Company, released a new JT20XP horizontal directional drill (HDD) package featuring a JT20XP drill and XP44 mixing system. This is the only drilling system in its class to utilize all on-board horsepower for thrust and rotation, according to the manufacturer. Together, the full 118-hp solution provides operators enhanced power and productivity for larger utility-installation jobs. The full XP package features a compact design making it easy to maneuver and transport between urban jobsites. And it offers contractors an all-diesel job site for more convenient operations and simple fuel service. Powered by a 74.5-hp Tier-IV Deutz diesel engine, the JT20XP HDD maximizes available horsepower for thrust and rotation. The drill delivers 14 percent increased spindle torque over its predecessor and offers 10 percent increased spindle speed than competitive units, allowing operators the ability to run downhole tooling at faster speeds for improved underground cutting. With no grease zerks — a Ditch Witch exclusive — the JT20XP is easy to maintain for increased uptime. And, the environmentally friendly, Tier-IV engine requires no DEF, further simplifying maintenance. Following a similar look and feel to all Ditch Witch drills, the JT20XP is equipped with a newly designed operator's station featuring ergonomic, adjustable seats to keep the operator comfortable for long hours on the job. And, an advanced, color LCD display provides engine diagnostics and informational messages, including electronic strike indicators (ESID), helping operators stay aware of what's going on in and around the drill and jobsite. The XP44 mixing system is equipped with a dedicated 44-hp Tier IV Yanmar diesel engine for superior mixing capabilities and drilling fluid delivery. As a powerful stand-alone, diesel-powered mixing system, the XP44 offers excellent mixing capabilities in a quieter package for less disruption in noise-sensitive areas, according to the manufacturer. For more information, visit https://www.ditchwitch.com/directional-drills/directional-drills/jt20xp-xp44. Ditch Witch, a Charles Machine Works Company, invented the underground utility construction industry, and today it designs, manufactures and markets a complete line of directional drills, drill pipe, HDD tooling, vacuum excavators, trenchers, chain, teeth and sprockets, mini-skid steers and vibratory plows. Handcrafted in the USA, its products are supported by the Ditch Witch dealer network with more than 175 locations worldwide. For more information, call 800/654-6481 or visit www.ditchwitch.com. Established in 1902, Charles Machine Works, an employee-owned company, founded in Perry, Okla., is the only manufacturer and global distributor that solely exists to make underground utility construction profitable. Its family of companies includes Ditch Witch, Subsite Electronics, DW/TXS, HammerHead, Radius HDD, American Augers, Trencor and MTI Equipment. For more information, visit charlesmachinev.works.